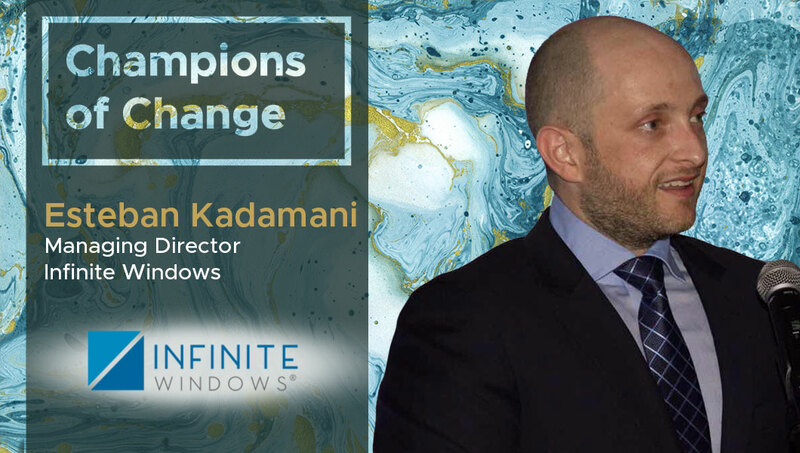 Esteban Kadamani: Infinite Windows is a glass and glazing contracting business in South Florida. I started the business with my business partner Santiago Toral when I was 23 and he was 25 with $200, a computer and lots and lots of effort. We started from the second bedroom of Santiago’s apartment, having a presence online as if we were a million dollar company, we had a phone system set up with a bunch of extensions, but all of them led to my cell. 13 years and a lot of up’s and downs later, we now have gross sales of 13 million a year and employ between 50-80 people. We now manufacture some of our products as well as install them. We focus on mid-rise buildings and high end residential. Esteban Kadamani: To be honest compared to most industries it has been slower due to a bad mix of cultural and practical barriers, but because I love new technologies, we tend to try a lot of them without being afraid of time wasted if most don’t work, because the ones that do make it all the effort worth it! Since it has been a slow transition for most of our industry and competitors this has been a huge advantage for us, and almost been our competitive advantage. We employ a team of software engineers just to work and focus on using the latest technologies to make our company more productive, more efficient and connect with our clients in more innovative ways than our competition. Esteban Kadamani: The use of blockchain in construction. Historically construction has been very slow to catch up with trends in other industries and I think the main reason has been that construction is a highly regulated industry (as it should be!) especially in our line of business which is Windows and Doors in South Florida, as they need to be impact-and-water-resistant for hurricane protection. But the use of blockchain could further help the existing regulations while adding more transparency and accountability to the industry. We could use it for administering contracts, identification, inspections, certifications and so much more. Esteban Kadamani: We do, and we embrace it. We currently have our own in-house CRM which we have been working on (and using) for 5 years. The nice thing about having this in-house is that we can modify, add or delete anything we want at any given time. Esteban Kadamani:Our CRM is so advanced that our clients can live-track every update pertaining to their project right from the point when they request a quote up until the last details of the finished project. We work towards this to ensure everything is measured and reported even the smallest of tasks and that the clients are constantly in the loop and can track the progress live. Esteban Kadamani: Personally I’m completely paperless (I hate when there is a form that requires me to sign it physically), I usually just sign it in Adobe. I don’t even have a printer in my office! But as much as we embrace paperless, our suppliers and clients are not there yet and we understand their hesitation and trust issues with digital documents when it’s a legal matter. That’s why I think blockchain could change this outlook. We cannot do it alone, it requires the industry as a whole for us to be completely paperless. Esteban Kadamani: That is a question I ask myself every day, our mission for the next quarter is to use technology to recruit and hire the right people. I have had experiences where people have an amazing resume and don’t live up to the expectations, whereas others don’t have much experience or education and yet exceed their peers. I’ve lost faith in resumes a long time ago, but even an interview (or ten) alone is not enough, we need to find a way to decipher the code of finding those diamonds in the rough! Esteban Kadamani: Again, our CRM. We grade people and departments by the time, efficiency, and many more equations to keep them on their ‘A’ game, that goes for the company as a whole. Esteban Kadamani: I travel a lot, I found that traveling, speaking to other people and cultures helps you discover the latest trends better. I also read magazines online through Twitter and LinkedIn. I’ve found that China is quite ahead in many areas of technology, and I’ve found it beneficial to follow groups and news through WeChat, since I speak basic mandarin.